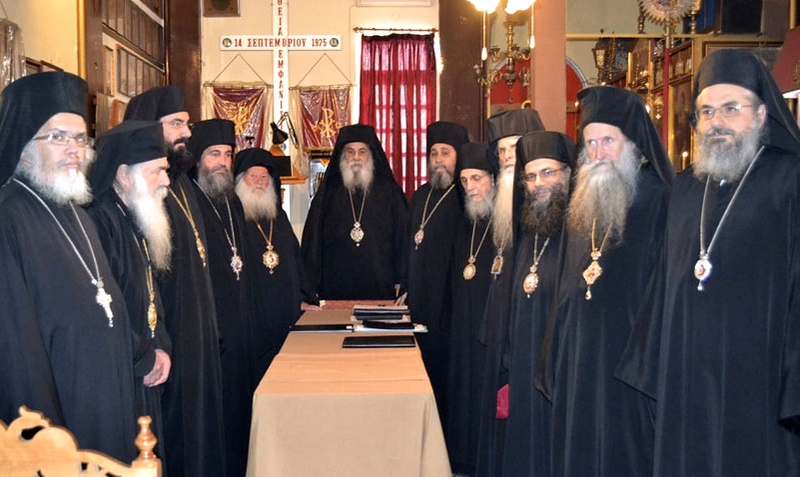 Today, March 5/18, 2014 the Holy and Sacred Synod of the Church of the Genuine Orthodox Christians of Greece under the Presidency of His Beatitude Archbishop Kallinikos of Athens and all-Greece convened in the church of the All-Holy Theotokos “The Unfading Rose” to unite and incorporate the Orthodox Ecclesiastical Community in Resistance into the Church of the G.O.C. of Greece. After the confirmation of the ecclesiological agreement and the lifting of the canonical impediments, the Bishops of the Orthodox Community in Resistance finally are full and canonical members of the Holy Synod of the Church of the G.O.C. of Greece. In continuation, the Holy Synod, with its new enlarged composition, successfully addressed the various organizational and jurisdictional issues related to the practical part of the Union. Finally, the Holy Synod appointed the Hierarchical concelebration to take place this coming Sunday, the Veneration of the Holy Cross, March 10/23 in the Monastery of St. Nicholas in Paiania, presided over by His Beatitude Archbishop Kallinikos of Athens and all-Greece.